Ford Motor Company presented its brand new 2014 Ford F350 Super Duty during the Vehicle Showcase. The F350 Super Duty has been America’s best-selling truck for over 35 straight years, built Ford tough and approved for use with B20 biodiesel blends. Steve Kelley is Fleet Manager for Mossy Ford San Diego. 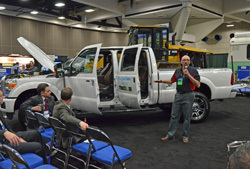 He shares insights into Ford’s new F350 and walks you through all aspects of the Super Duty’s traits.